Received the "2012 Preservation Buffalo Niagara - Rehabilitation/Adaptive Reuse Award"
The Gatehouse was built to house the caretakers of the Arthur Hedstrom estate. Originally, there were two gate houses and two barns. One gate house was dismantled in the 1890s. One barn burned in 1968. The site includes the west house which was built circa 1820, the east house circa 1850, a pre-existing shed, and the former toll gate which stood directly in front of the west house. In 1904, all were wrapped in stucco, and the pre-existing barn was stylistically altered and used as a carriage house. 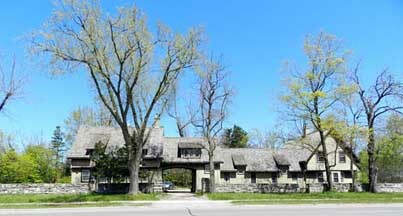 1 large building behind the west house (became site of new Hedstrom barn which burned in 1968. 2. it was behind the former tollgate. The grandson (87 years old) of the caretaker (caretaker with his family in the east house) said the house was always referred to as the gate house by its inhabitants. The west house was intended as housing for farmers. Hedstrom's unmarried sister-in-law Mabel Wilcox lived there for many years. Our guess: from 1919 because of the 1919 newspapers in the altered walls. The estate was called Four Winds Farm. The estate, bounded by Main Street and Getzville Road, was reported to be 200 acres and nearly reached Sheridan Drive. Presently (February 2002) the Gate House property is a 1.6 acre corner lot on the north side of Main St. and the west side of Getzville Rd. Arthur Hedstrom died in 1946; three years later, his widow Katherine Wilcox Hedstrom sold the remaining 35 acres of the estate to Genrich Builders, and the Gate House was converted to apartment use. Most of the 35 acres has been developed; the Gate House and the Estate House properties are now separated by High Court. The Gate House has not been used as apartments for some years. The property was sold in 2006; the new owners [Caroline and William Duax] are restoring and protecting the buildings. The interior of the house has been gutted revealing the earlier structures. The architect who designed the new building from the old in 1904 was Frederic Loverin who also designed the Lenox Hotel. Loverin included Tudor Revival details in his alterations: highly pitched roof, laticed windows, dormer windows. Eric L. Hedstrom founded the coal firm E. L. Hedstrom & Company in the late 19th century. He was also the Director of the Buffalo Bank of Commerce. His son, Arthur E. Hedstrom born in 1869, inherited the company, merged with Spaulding in 1927, and was the president of the Hedstrom-Spaulding Company until his death, nineteen years later. The company was one of Buffalo's largest coal dealers. Arthur Hedstrom was a philanthropist and, in 1915, a co-organizer of the Amherst Community Church; he was also a trustee of the church. Amherst Community Church was founded by Hedstrom and others for the purpose of conducting interdenominational worship services and Sunday school classes for the children of the entire community. The Amherst Community Church continues today as an institution which serves the community and stands as a landmark. Hedstrom was also an active leader of the Buffalo YMCA. He was a member of the board of directors from 1900-1926 and of the board of trustees from 1920-1932. Following World War I, Hedstrom was chairman of the committee which remodeled the adjoining building at Pearl and Genesee Sts. In addition to his involvement with the establishment of the Amherst Community Church, Hedstrom was also an active member of the Delaware Ave. Baptist Church. He supported other Baptist churches in the area including the Memorial Baptist Church at Summer Place and Walden Avenue. Hedstrom was a life member of the Albright Art Gallery and the Buffalo Public Library. Arthur Hedstrom and his wife Katherine Wilcox, the youngest of the ten Wilcox children, were considered "pioneer suburban residents" when they settled in Amherst. In a Buffalo Courier Express article concerning the sale of the then 35 acre estate to Genrich Builders (July, 10, 1949), A. E. Hedstrom's widow is quoted: "When we purchased the property, it was merely run-down farm land, although we saw in the layout of land something very pretty." The article also said Mrs. Hedstrom was "happy to hear of the Genrich firm's plans to preserve the beauty of the home and grounds." Hedstrom had built a large stone mansion, now accessed off Getzville Rd., where he and his wife lived for 43 years; they had three children. "Also located on the ‘showpiece’ estate were a row of caretakers cottages, a riding stable, a pool and pool house, and an orchard." The building of estates and horse farms which began to emerge in the 1890s along Main Street in Eggertsville-Snyder, was at the forefront of residential expansion in Amherst. In addition to Arthur Hedstrom, estates were built by Sattler, Farber, Wm. Crosby, Pomeroy, and Rosa Coplon’s two sons. Prior to this time, Williamsville was the focus of population, commerce, and industry in the town because of its strategic location on old Buffalo Rd. (Main St.) at the falls of Ellicott Creek. This site is also significant as the site of the last tollgate along Main Street in Amherst. To quote from Joseph Grande's recent pictorial history of Amherst: "The Buffalo and Williamsville Macadam Company erected the Tollgate in 1839 along with one at Main Street and Humbolt Parkway in Buffalo when the macadam toll road was laid. The Williamsville Tollgate, located on Main Street in Snyder, 300 feet west of Getzville Road, was one of fifty to sixty erected between Buffalo and Albany. It was the last one to cease operation, closing its door on October 13, 1899." According to the July 10, 1949, newspaper article announcing the purchase of the property, "The smaller gate house was remodeled during the last century from a log cabin used as a toll gate house. On the site of what was then known as the Buffalo Rd., the cabin housed tax collectors who stopped all horse drawn vehicles for payment of tolls for use of the road." In the Intensive Level Survey of Historic Resources by Bero Associates Architects of Rochester and commissioned by the Town of Amherst, the section on the Gate House states that "as part of the the original Hedstrom estate the Gate House property represents the best collection of historic resources associated with an early 20th century suburban estate in Amherst." The Gate House and barn are superb examples of Tudor English cottages and embody the distinctive characteristics of the eclectic Tudor Revival architectural style. Although constructed for caretakers and as work buildings, the Gate House and barn retain a relatively high level of integrity of design, materials, and craftsmanship. The Tudor-Revival style first appeared in late 19th century in architect-designed homes patterned after late 16th to early 17th century English architecture: an eclectic mix of Late Medieval prototypes. It was the dominant style of domestic building for a large proportion of early 20th century suburban homes throughout the country. Examples of the style before the 1920s & 1930s are relatively rare and are uncommon before WW1. The method of constructing exterior walls changed during the Tudor Revival period as a function of technology. In a small percentage of buildings, walls were stucco clad and were most common on modest houses such as the Gate House built before the widespread adoption of brick and stone veneering techniques in the 1920’s. Walls were both with and without false half-timbering. Another distinctive feature of the Tudor Revival style is steeply pitched gabled roofs and dormers. The roofs are usually side-gabled with a steeply pitched cross gable such as the far right section of the Gate House. Overlapping gables with eaves lines of varying heights is also common. As well, upper stories and gables may overhang lower stories. The doors and entryways of the style are often arched such as the high entry to the courtyard within the Gate House building. The original address of the mansion was 4200 Main St. and was accessed by horse-drawn buggy and then by automobile through this arched entrance. Decorative half-timbering over doors is also common although the half timbering over two of the Gate House doors may have been added later..
Windows in Tudor-revival buildings were either casement or wood double-hung sash, commonly and functionally in groups. Such groupings are often seen in bays. Multi-pane glazing in diamonds (lattice windows) or rectangles is also common. Side Porches are frequent and are often under main roof of house. The Gate House sun porch is an example. The rustically attractive and well built quarry stone wall [Onondaga limestone] which extends along the entire lengths of the Main St. and Getzville Rd. property lines has survived nearly 100 Buffalo winters. It completes and defines the Gate House property even though the original Estate acreage is no longer intact. Another distinctive feature of the Tudor-revival architectural style is asymmetrical massing or construction design which results in a rambling building of distinct parts. The Gate House is a superb example of this. Town of Amherst Assessor & Planning Dept. Buffalo Evening News, July 9, 1949, "Hedstrom Estate, Area Showplace, Bought by Genrich"
Buffalo Currier Express, July 10, 1949, "Palatial Amherst Home to Become Apartments"
It is associated with the lives of individuals, or of people, or of events significant in the national, state or local history. It embodies the distinctive characteristics of a type, a period, or a method of construction. Represents the work of a master architect or designer, or possesses high artistic values. Represents a distinguished entity whose components may lack individual distinction. It represents an established and familiar visual feature of the neighborhood because of a unique location or singular physical characteristic.